The uses for photogrammetry in archaeology are varied - from artifact modeling, to the modeling of large excavations from kite photography! 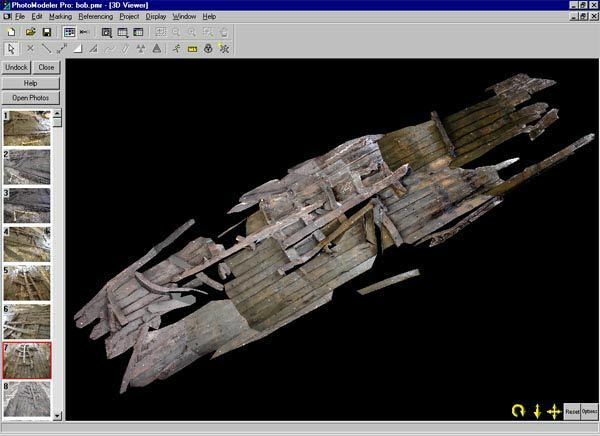 We’ve seen some fascinating sample projects completed by PhotoModeler and non-contact, non-invasive scanning technology of PhotoModeler Scanner. 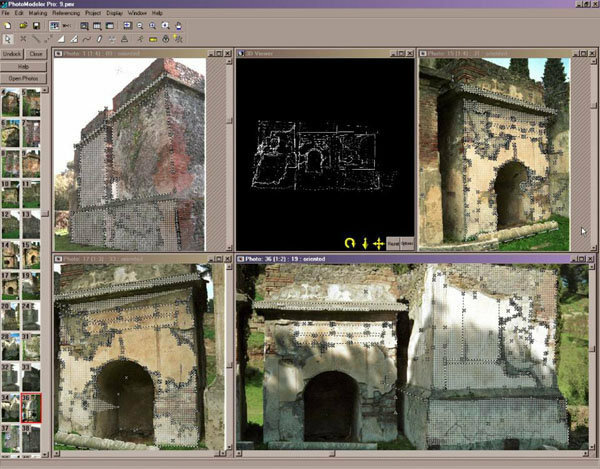 PhotoModeler has proven to be a valuable tool for documenting heritage sites across the world. The "Fonte do Ídolo" is a historical monument in Braga, Portugal. It is a small 1st century AD Roman sanctuary which is carved from solid rock and had been an important and popular historical site. The Fonte do Ídolo's preservation is being threatened, as the site has been closed to the public for 2 years. The fight for its protection has been left to heritage organizations such as the ASPA and UNESCO. This project was provided to Eos Systems, courtesy of INFOTOP of Portugal. This was a very large and detailed project, containing 2277 3D points, and 151 photographs taken with a Kodak DC4800 digital camera. The final 3D model will be displayed on the web for educational purposes. During the construction of the new Opera house in Copenhagen, 3 old shipwrecks were found. The age of the ships have been determined by dendrology. One ship was built in Danzig, Poland in the year 1405. 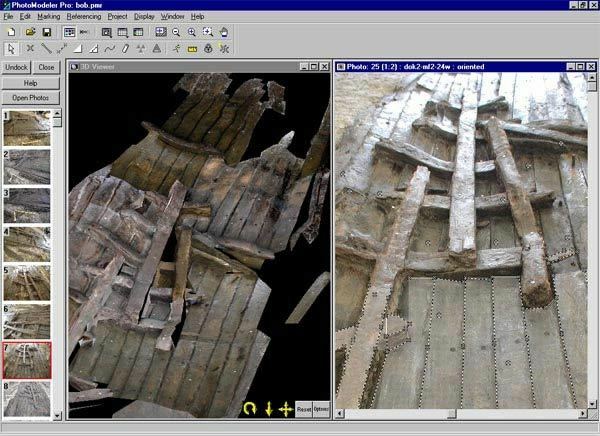 It is 45 feet long and the oak planks were still preserved as if they were new! The ships had been sunk intentionally to stop enemies from attacking Copenhagen. This project was conducted by Marco Canciani at the Faculty of Architecture at the University of Rome, Italy. 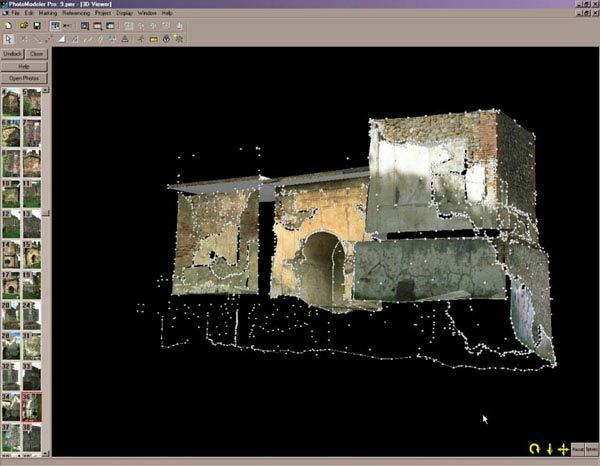 The University is using PhotoModeler as part of their research for new methods of visualizing and documenting historic buildings and structures for preservation. 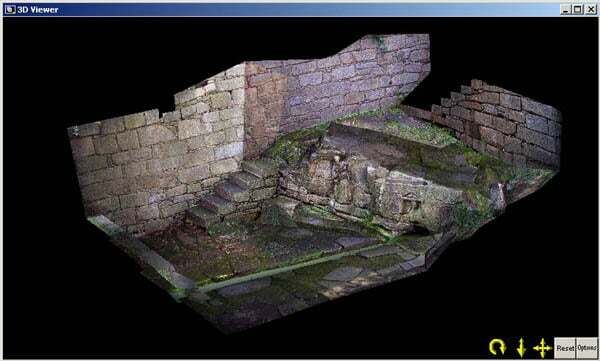 The goal of the study was to add modern 3D modeling techniques to traditional methods of analyzing buildings. The study was done on a set of historic buildings in Pompeii, Italy. These small buildings are rich of architectural elements which show their evolution - from original design to restorations done following an earthquake in the 19th century. The building shown here is a tomb near Porta Nocera. Working directly with photos rather than drawings results in a more complete system of documenting these historical structures. galleries within the cave. 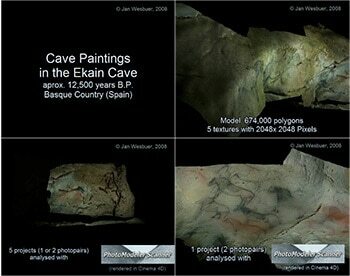 The Ekain cave, in July 2008, was added as a UNESCO World Heritage Site. Six PhotoModeler Scanner projects were created of two parts of the Zaldei gallery to evaluate the possibilities with PhotoModeler Scanner. The screen shot here is of one of those projects. The projects consist of one or two photo pairs, each taken with a Nikon D70s with 27mm focal length lens. The projects were exported (including textures) from PhotoModeler Scanner and then imported into Cinema 4D to make final adjustments to the model & textures and for rendering. This project and video were created by Jan Wesbuer. The resulting models have close to one million triangles, and seven 2048 by 2048 texture images together. The four frames of a video shown on the right are from the full-length movie. View full movie below. 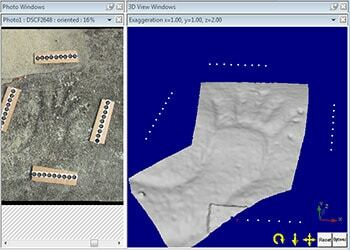 This surface scan is of a hand-shaped petroglyph found on Hornby Island, BC, Canada. 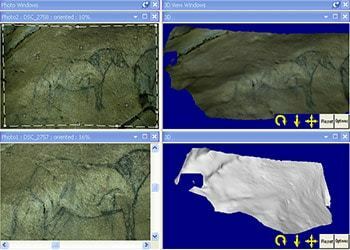 Two photographs with some coded targets placed on the ground were used to build the project for scanning. 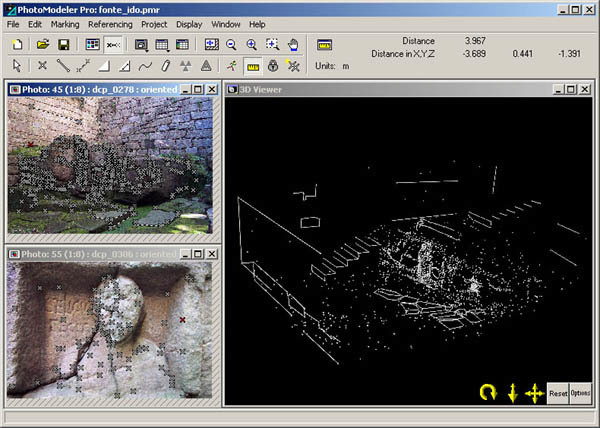 This animation shows the shaded form of the resulting mesh from PhotoModeler Scanner's 3D Viewer - showing coded target 3D points as well. An exaggeration factor of 2.0 in the Z axis was applied to make the shallow carving stand out.